In this article, we’re providing you with two high-quality TOEFL essay templates for the Integrated and Independent Writing tasks. Before that, we’ll go over the differences between the two TOEFL Writing tasks and then discuss how our TOEFL essay templates can benefit you. After, we’ll teach you how to customize and use our templates. What Essays Will You Write on the TOEFL? The Writing section is the final section you’ll face on the TOEFL, and it consists of two separate tasks: an Integrated Writing task and an Independent Writing task. The Integrated task requires you to write a response comparing a lecture and an article, whereas the Independent task requires you to write an opinionated essay in which you agree or disagree with an idea. Below, we examine the two TOEFL Writing tasks in detail. For the Integrated task, you must read a passage on an academic topic for three minutes and then listen to a short lecture on the same topic. This lecture will either support or challenge what’s written in the passage. Your response must summarize the main points discussed in the lecture and explain how these points relate to the reading. You’ll have a total of 20 minutes to write your response. Your response should be around 150-225 words. During this time, you may reread the passage; however, you may not listen to the lecture again. The score you receive for this task will be on a scale of 0-5. According to the official rubric, a level-5 essay (i.e., a perfect essay) selects the most crucial information from the lecture and presents it in a coherent, accurate, and well-organized manner. A level-3 essay is satisfactory but overall vague, with fewer key points and several grammatical errors. Finally, a level-1 essay offers minimal coherency and fails to address any of the main points in the lecture. ETS (the creators of the TOEFL) offers several samples of scored Integrated essays online. Question: Summarize the points made in the lecture, being sure to explain how they oppose specific points made in the reading passage. For the Independent task, you will write about your opinion on a certain topic. You must provide clear reasons and specific examples for why you agree or disagree with the issue or statement. (This doesn’t have to be your real opinion, though!) You’ll have 30 minutes to write your response. A typical high-scoring essay is at least 300 words. You’ll receive a score on a scale of 0-5. According to the official rubric, a level-5 essay effectively addresses the topic, provides clear and ample details, and contains at most only minor issues with grammar and word choice. A level-3 essay offers a generally coherent response with occasional slips in clarity. Finally, a level-1 essay offers little to no detail and contains multiple technical errors. You can look at samples of Independent essays on the ETS website. Additional Details You must read a passage and listen to a lecture before you begin writing. You may look at the passage as you write your response. You do not have to write about your real opinion! You may pretend to agree or disagree. What Is a TOEFL Writing Template? The purpose of a TOEFL Writing template is to help you compose a detailed and eloquent essay — and of course get you a high Writing score! But what exactly is a template? Furthermore, writing templates are typically created to suit different types of essays. For example, a template for a compare/contrast essay will differ from a template for an editorial piece. This is why it’s so important you use a writing template specifically geared toward the TOEFL! What Are the Benefits of a TOEFL Writing Template? There are three major benefits to using a TOEFL Writing template. Using a TOEFL Writing template ensures you’ll have a focused and well-organized response. A high-quality template teaches you how to structure your response so that your introductory, body, and concluding paragraphs are all clearly defined. This way, even if your grammar and spelling aren’t perfect, your response will still have an overall strong framework that’s easy to follow. TOEFL essay templates also show you what kinds of transitions you can use and where. Transitions are a key component of essays that allow you to connect your thoughts and progress to new ideas smoothly. Truth be told, you probably won’t score super highly on the TOEFL Writing section if you don’t use any transitions! Another big benefit of using a TOEFL Writing template is that it saves you time on the Writing section. Since you’ll already have a sense of how you’re going to structure your essay, you’ll spend less time planning it out and coming up with transitions, openings, and closings. As a result, you’ll get more time to actually write out your response! Lastly, a TOEFL Writing template allows you to feel more prepared on test day. Many test takers find it difficult to write out responses to English-language prompts in only 20 or 30 minutes. But TOEFL essay templates equip you with the skills you’ll need to feel more confident in your writing skills — and confidence is the first step toward getting a great TOEFL score! In this section, we offer you a TOEFL Integrated Writing template and an Independent Writing TOEFL template. We also provide you with a handy list of key transitional words and phrases you can incorporate into your essays. Please note that you do not need to follow these templates directly. In fact, we strongly encourage you to replace our sample words and phrases with your own. We will talk more about how to customize our TOEFL essay templates in the following section. But for now, let’s take a look at the templates! Before we dive into our TOEFL Integrated Writing template, let’s get a quick reminder of what the Integrated task entails. For this task, you’ll read a passage and then listen to a lecture. Your task is to summarize the lecture and explain whether the lecture challenges or supports what’s written in the passage. You’ll have 20 minutes to compose a response of around 150-225 words. We’ll divide our template into four paragraphs: an introduction and three body paragraphs. You shouldn’t need a separate concluding paragraph for this task, as you can still score a 5 without one (plus, you likely won’t have enough time to write one!). But if you want to write a conclusion, just be sure you keep it short — two to three sentences at most. Now, on to the TOEFL Integrated Writing template! Your first paragraph will introduce the lecture and how it relates to the reading. This paragraph doesn’t need to be long; a simple two or three sentences should suffice. 1. Begin with a topic sentence that summarizes the main point of the lecture. 2. Next, explain whether the passage refutes or supports the main point of the lecture. In this paragraph, you’ll want to focus on one of the key points in the lecture and explain whether the passage refutes or supports this idea. 1. Introduce the main point you’ll be discussing. 2. Next, describe this particular point in more detail and then discuss how the passage either refutes or supports it. I suggest using one to two sentences here. 3. Finally, conclude your paragraph by explaining what this difference or similarity means. In this paragraph, you’ll focus on another key point in the lecture and again discuss how the passage either agrees or disagrees with this idea. The structure here is essentially identical to that of paragraph 2, so make sure you are using new transitions and varying your word choice. 2. Next, explain this key point in more detail and elaborate on how it is either refuted or supported by the passage. As with paragraph 2, I recommend using one to two sentences here. 3. Finally, explain what this difference or similarity means. This final body paragraph will offer your last key point in addition to a brief conclusion. Once again, try to vary your transitions and words here so that your body paragraphs do not sound redundant. 2. Then, explain this point in more detail and discuss whether the passage matches or challenges it. Use one or two sentences here. 3. Finally, conclude your paragraph by explaining the significance of this similarity or difference. You should also look at this sentence as the conclusion to your entire response. Remember, you do not need to write a separate concluding paragraph for this task; it’s perfectly OK to combine it with your last body paragraph! For this task, you will read a short prompt and then write a response explaining whether you agree or disagree with the issue or idea. Unlike the Integrated task, here you’ll be writing an opinionated response (though you do not have to write about your actual opinion). You’ll have 30 minutes to write an essay of at least 300 words. Because this essay should be longer than the Integrated task, it’s best to use the basic five-paragraph structure, with an introduction, three body paragraphs, and a conclusion. Note that many of the example sentences below are based on the sample Independent Writing prompt used above. This means that these sentences will not apply exactly to other prompts! So don’t simply copy the sentences onto your test; instead, use them as a general guide to help you develop a better sense of style and flow in your writing. Now, let’s take a look at our Independent Writing TOEFL template. In this paragraph, you’ll introduce the main issue or idea and rephrase the prompt in your own words. Then, you’ll state whether you agree or disagree with the statement and why. 1. For your first sentence, you’ll want to come up with a hook that introduces the topic of your essay in a unique and creative way. Most people start broad and then get specific. This sentence is also a great opportunity to insert a hypothetical question. It is said that … But is this always true? Many people wonder whether telling the truth at all times is necessary in order to maintain a healthy relationship with someone. 2. Next, introduce your opinion on the topic. You may list your specific reasons for your opinion here or in the following sentence(s). Remember, this doesn’t need to be your real opinion! For me, although telling the truth is important, there are many cases in which it’s OK to lie. 3. Here, state how many points (three is ideal) you’ll be discussing in your essay and then briefly summarize what these reasons for agreeing or disagreeing are. Your reasons may come from facts, predictions, personal beliefs, experiences, etc. In this essay, I will address three potential problems with lying in relationships. Lying is never a smart idea because it undermines trust in relationships, causes feelings of betrayal, and often leads to more lying. In this paragraph, you’ll introduce your first key point about the issue and offer specific examples illustrating why you agree or disagree. 1. For the first sentence, introduce the key point you want to talk about. First of all, lying can make it difficult to trust someone in a relationship. 2. Next, provide an example to explain why you believe this is the case. I suggest using a hypothetical situation somewhere in your essay to help illustrate one of your points. For example, if a father lied to his daughter by telling her she was good at drawing, the daughter might begin to wonder whether her father has lied to her about other things, too. 3. Continue your paragraph by elaborating on your example. Explain any effect or consequence of the example and discuss how this outcome supports your viewpoint. The next time the father praises his daughter for something, she might believe he is lying, even if he isn’t. In other words, the daughter might find it difficult to trust her father, thereby damaging their relationship. This paragraph will follow a similar structure to that of paragraph 2, only this time you’ll discussyour second key point. To prevent this paragraph from sounding too similar to the one before it, vary your word choice and choose a different type of example on which to focus. Second, lying can cause feelings of betrayal in relationships. 2. As you did in paragraph 2, use these next few sentences to elaborate on your point and offer specific examples. Always clarify how your examples support your stance (agree or disagree) and how they relate back to the issue stated in the prompt. When I was young, I lied to my best friend about being able to attend her birthday party. She later told me I’d betrayed her and that we couldn’t be friends anymore. Essentially, because I’d lied to her, I destroyed our relationship. This is the last body paragraph in which you will introduce and explain your third and final key point. 1. First, introduce your third point. As this is your final body paragraph, make sure you’re using appropriate transitions, such as “finally,” “last,” “lastly,” and “third,” to introduce your point. Lastly, lying often begets more lying. This means that once you tell a lie, you will become more likely to tell other lies. 2. As you did in paragraphs 2 and 3, elaborate on this point by providing new evidence, details, and/or examples. Explain why this point is important and how it supports your stance on the issue. If you lie but nobody knows you’ve lied, you might begin to believe it’s OK to lie. As a result, you start to lie more and more. However, once people realize how often you lie, they’ll likely lose all trust in you and might even decide to end their relationships with you. Like the Integrated Writing task, a separate concluding paragraph isn’t always necessary here. That said, if you have time, I recommend quickly wrapping up your points in a concise yet effective conclusion. One to three sentences should suffice. 1. In the first sentence or two, summarize your stance and explain why you feel this way. You may re-introduce your three main points here. You may also paraphrase the prompt and explain once more whether you agree or disagree with the issue and why. In the end, I believe telling the truth is the most important consideration in a relationship. Ultimately, lying can easily destroy relationships because it weakens trust, results in feelings of betrayal, and often causes more lying. 2. Finally, if you have time, bring together your concluding paragraph with a single general statement about your viewpoint. This is why it is imperative we always refrain from lying. Thus, the only way to ensure your relationships with others are healthy is to always tell the truth. In addition to TOEFL essay templates, we offer you an assortment of common transitions and phrases you can use in your TOEFL responses. These words will allow your writing to flow more smoothly and connect your thoughts in a clearer, more logical manner. Below, we offer you a few pieces of advice to help you customize your TOEFL Writing template. Here are two ways to customize our TOEFL Integrated Writing template. The sample sentence and openers we’ve provided above don’t contain any specific information, so you are welcome to incorporate these examples into your own Integrated Writing response however you like. Just be sure that the examples you’re using in your essay fit with the type of lecture-passage relationship you’re given. Remember, this relationship can be either supportive (in which the lecture agrees with the passage) or contrastive (in which the lecture disagrees with the passage). Most Integrated Writing tasks will give you a lecture that challenges what’s written in the passage. In these cases, it’s important you use a variety of transitions, conjunctions, and prepositions to emphasize this important contrast throughout your essay. There is one caveat, though: do not use a single transition more than once in your response. For instance, if you were to consistently start your supporting sentences with “however,” your essay would lack balance and begin to sound redundant. So be sure to vary your word choice! Here are three ways you can customize our Independent Writing TOEFL template. Although the Independent Writing task asks specifically whether you agree or disagree with an idea, you do not need to write about your real opinion. What you should really do is choose the side that’s easier to argue — regardless of whether you actually agree or disagree with it! In other words, it’s perfectly OK to make things up for this response and pretend you support something you don’t actually believe. Remember, you are not being judged on which stance you choose but on how effectively you support your stance. For this task’s examples, I’ve primarily supplied you with whole sentences, all of which were based on the sample Independent Writing prompt used above. Because our examples refer to a specific prompt, you cannot copy these sample sentences word for word and use them in your own essay. Failing to change these sentences means your essay won’t make a whole lot of sense, if any at all! Therefore, what you should actually be doing is using these example sentences to learn what types of details to include in your Independent Writing response. You may also use our examples to get a feel for how you can change up your sentences and word choice. For your response, you must come up with specific details and examples to support your viewpoint. These examples can range from facts and statistics to experiences and hypothetical situations. In order to produce a truly compelling response (and get a high essay score), you must incorporate a variety of effective examples into your essay. This means you’ll want to avoid using the same types of examples for each point you make. So if you were to discuss a personal experience for your first body paragraph, focus on a different type of detail, such as a universally accepted fact or a hypothetical scenario, for your second body paragraph. Finally, here are four general tips for using a TOEFL Writing template effectively. The sample sentences and openers we’ve given you for each template above contain different transitions to help link ideas together; thus, we encourage you to use a variety of transitions in your own essays. For ideas, refer to our transition list above. This list can help you swap out some of our sample transitions for other ones you believe fit better with your writing. Ultimately, varying your word choice is critical to ensuring your essay is well written. This means that a high-scoring TOEFL essay will not simply use transitions but use them well. So if you’ve already inserted “therefore” in one area, try using “as a result” or “thus” in another area. You’ll still get the same meaning but with a stronger, more versatile effect. Don’t feel limited by the number of sentences we’ve included in each body paragraph in our templates. If you need to use two or three sentences to explain a point, that’s OK! You should always give a lot of detail for your points — so long as you are staying concise and focused. For example, if you spend a paragraph discussing a hypothetical scenario but fail to offer any analysis, you probably won’t receive a high TOEFL score. Likewise, if you write a verbose introduction or conclusion, your score may end up being lower than you wanted it to be. Basically, you must find the perfect balance between detail and analysis. A good way to monitor this balance is to always try to hit the word minimum for each task. Doing this means you’ll likely have an essay that’s sufficiently detailed. Just try not to exceed the maximum or you’ll risk rambling! Each of our TOEFL essay templates above has three body paragraphs and three main points. Although three points is a solid number of points, if you can only think of two points, just stick with those and try to support them as clearly and effectively as possible. As you can see in the sample TOEFL essays here, many essays with scores of 2 and 3 actually address three points — but their points are altogether weak, with few supporting details and insufficient analysis. What this means is that just having three points in your essay isn’t enough to guarantee you a high essay score. Thus, it’s far better to write an essay with two strong points than three weak ones. If you struggle with English, you might be tempted to borrow some sentences and phrases from the prompt. While it’s OK to paraphrase sentences, you should never copy exact sentences from your prompt. Copying the prompt shows evaluators that you lack the English level necessary for writing creatively and analytically. On top of this, copying is also a form of plagiarism, which means you are essentially “stealing” another’s work. Recap: How Can a TOEFL Writing Template Help You? TOEFL essay templates are an especially useful component of TOEFL prep because they raise your chance of achieving a high TOEFL Writing score. With TOEFL essay templates, you can organize your thoughts more clearly, spend less time outlining your responses, and prepare for the TOEFL with increased confidence. Our templates are also flexible, allowing you to customize certain elements to your liking and cater the templates to many different prompts. 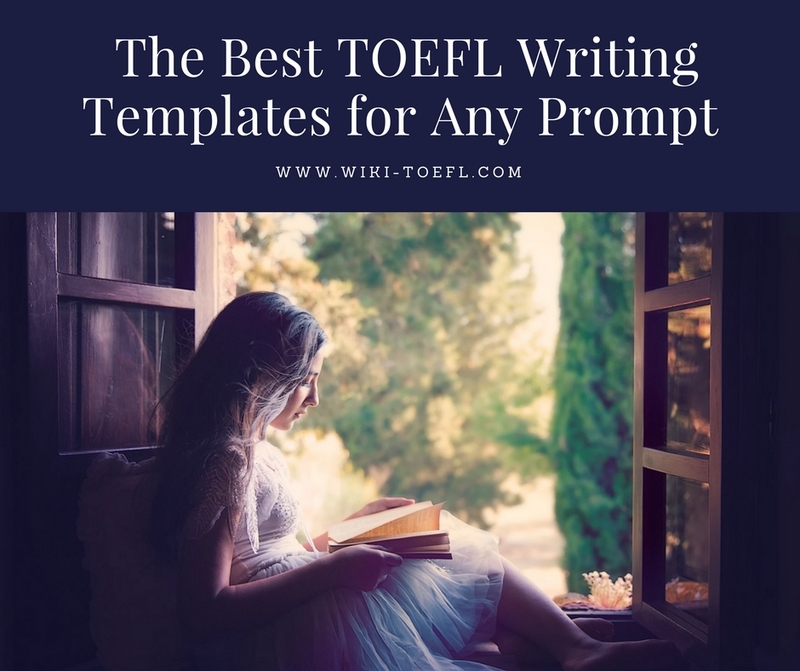 Now that you’re equipped with our TOEFL essay templates and the knowledge of how to use them, you should have no trouble getting a great TOEFL Writing score!